The quote above is a reworked bar from Black Star’s song “RE: DEFinition.” Playing to a packed Club Nokia in Los Angeles in September, 2012, Talib Kweli and Yasiin Bey switched things up during their live set of the song and pronounced to the crowd, “Son we way past the minimum, entering millennium/ Let’s get free just like the Palestinians!” (The original line is: “raps will hold a gat to your back like Palestinians”). It was, in one swift and dominant showing, one of those “bigger than hip-hop” moments, and with two of the most conscious MCs out there in Talib and Bey—not to mention Beat Junkies creator and mastermind J Rocc behind the 1s and 2s that night—the message was clear that hip-hop was at the defense of Palestine. 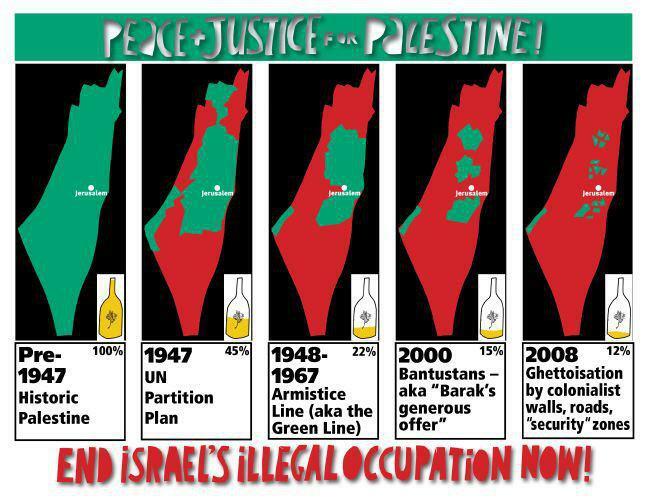 Justice for Palestine isn’t just a Black Star thing though. In fact, it’s slowly becoming a movement within hip-hop as a whole. The politically charged and always affluent, Lowkey, has a song that’s distinctly called, “Long Live Palestine.” This moving track blends ballad-like choral singing and hard-hitting punches, and as the first verse ends, Lowkey not only attacks the Israel apartheid state, but also America’s blind-backing allegiance to Israel itself. So why are two of hip-hop’s most prominent and outspoken figures Palestinian allies, along with a slew of other hip-hop artists as well? The better question is: why aren’t there more? Unless you’ve been detached from the news, or have been living under a rock, you know full well that tension in the West Bank and Gaza have been making headlines as of late. Although this isn’t some offshoot anomaly, the reason for these latest headlines seem to stem from intense focus on the tragic kidnapping and killing of three Israeli teenagers back on June 12. The three teens were Naftali Fraenkel, Gilad Shaer and Eyal Yifrah, and their bodies were found on June 30 in a field northwest of Hebron. What trickled from this travesty soon culminated into a free-flowing stampede branded with even more tragedy. In response to the missing teenagers, Israel launched a wide-ranging search for the missing teens, which has resulted (as of June 23) in over 350 Palestinian arrests and four deaths, including a 14-year-old boy. From here things kept on piling on, and last week, Mohammed Abu Khdeir, a 16-year-old Palestinian boy, was found dead in a Jerusalem forest, having been burned to death. 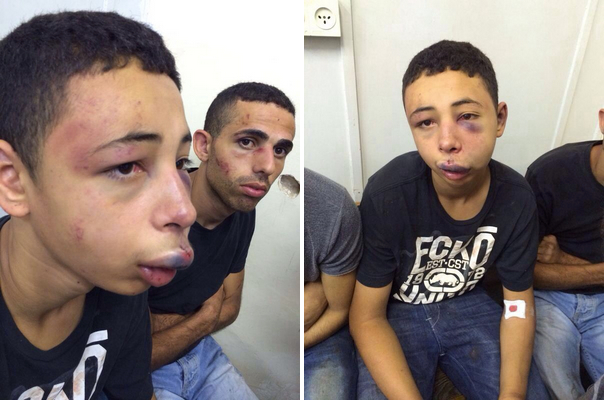 It was then just as shocking, if not more so, when Tariq Abu Khdeir (Mohammed’s cousin), who is a 15-year-old American student in Tampa, Florida, was brutally beaten and knocked unconscious by Israeli police last Thursday. The act itself was caught on tape, and in the footage you can see two Israeli officers holding down and pounding a motionless youth, believed to be Khdeir, before picking him up and carrying him away. Add these events to Israel’s increased bombings in Gaza (after only 24 hours, 23 Palestinians have been killed and 123 injured), the continuous clampdowns on Palestine as a whole (which has been effectively going on for more than half-a-century), Israel’s apartheid laws (some of which include: prohibiting Palestinians from certain settler-only highways while Israeil citizens don’t have any restrictions at all; Palestinians are under military law, while Israelis are under civilian law; the constant expansion of Israeli settlements into Palestinian land; forced segregation in schools; mandatory IDs identifying people by race and religion; and over 800,000 Palestinians have been imprisoned since 1967) and Israel’s inhumane actions against African immigrants, and you might wonder why these latest stories are nothing close to an anomaly. Lloyd’s passage here resonates with me for a couple of reasons. First, he clearly and distinctly mentions that the death of the three Israeli teens was tragic, which it is. It’s important to state that whoever committed these crimes be punished, but that shouldn’t come at the cost of an entire population of people, their land, their homes and their families. Nor should it entirely wipe out the fact that thousands of Palestinian children have been abducted and killed at the hands of the Israeli government for decades and that is never on the news—a simple explanation for this: western media. This should be a no-brainer, but for those of you that are unaware, the United States is Israel’s biggest ally, and so any negative news for Israel is usually omitted from broadcasts. Secondly, and although Lloyd doesn’t mention it I will, being anti-Israel is in no way being anti-Semitic. Going against the oppression of one faction over a group of people is simply stating that you believe in justice and equality for all. So why is it important for hip-hop to become involved? Because hip-hop was born and bred out of the same type of oppression: restriction of basic human rights, targeting a group of people because of their race and unjust political, social and economic inequality. We here at Bonus Cut have stressed that hip-hop is a worldview and a way of thinking, and the Israeli-Palestinian conflict is a glaring example of how hip-hop activists and artists not only focus on domestic issues, but also important world issues as well; furthermore, with Palestinian hip-hop groups like DAM coming out of the word work, this further displays the spread of hip-hop on a global scale. Like Talib Kweli, Yasiin Bey, Lowkey, Sacramento Knoxx (who has continually posted “justice for Palestine” threads on his facebook) and DAM, the rest of the hip-hop world needs to take notice and take action. The problems that Palestinians face every day won’t get coverage from western outlets, so it’s up to independent artists in other fields, such as hip-hop, to spread and raise awareness. Whether they’re the lyrics in a song like Black Star’s “RE: DEFinition” or a tweet informing people about the situation, teaching the facts and spreading the word is something hip-hop has continually done since its inception. What’s different now is that we have so much at our disposal, and with the click of a mouse, information can be sent from one end of the world to the other. The hip-hop community needs to harness these resources and demand justice, not only for the goings on in Palestine, but also for all the other atrocities damaging this beautiful world. Going further than this, figures in the hip-hop community can use these outlets to fuel and launch new ways of resisting the cruelty and injustice of this world that goes further than lyrics in a song or a tweet on the internet. As of late, Talib Kweli has been turning to Twitter to share his thoughts and opinions and use that as a launchpad for direct action. It’s here where the hip-hop defense is so utterly important to the causes it backs. Lyrics in a song only go so far during a movement, but here we actually see hip-hop–and in this case Talib Kweli–acting on those words and doing something about the injustice happening. By cancelling his show in Israel, Talib is leading by example, showing the rest of the hip-hop world a way of acting on the thoughts and beliefs expressed that go beyond a two-bar statement in a song or a protest tweet. Whereas a song lyric may or may not be heard by the oppressor, by directly confronting the issue (Israel), Talib has made sure that his message has been heard and that it’s clear. I asked before why there aren’t more defenders of Palestine in the hip-hop community, and that question has now morphed into a bigger question: why aren’t there more hip-hop figures actually taking action? 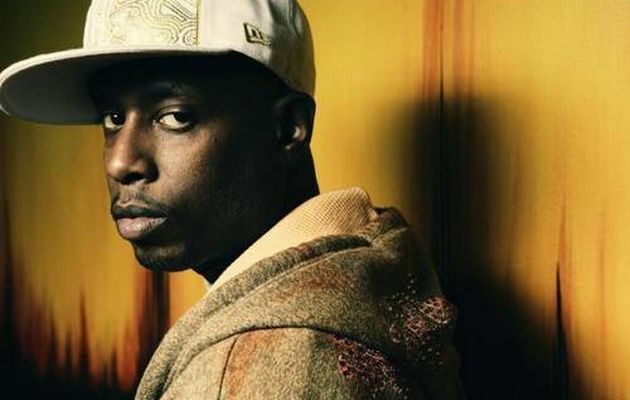 Talib Kweli is a great example of an artist who not only preaches words of justice in song, but also acts on those lyrics and carries out actions outside of the studio and computer screen. As with Yasiin Bey before him–who volunteered to take part in a videotaped force feeding to show his followers and millions what is happening in Guantanamo Bay–Talib Kweli has taken a physical stand atop the pedestal of what’s right and what needs to be done in order for more to follow. You can verbally declare what’s wrong with injustices happening around you, and that may be good enough in your mind, but until you actually take action, your words don’t have as much of a bite. Like Talib Kweli, we should all strive to continually vocalize what’s right and what needs to be done, but we also need to act upon those words and actually make that change happen.